Happy Thanksgiving friends. So thankful for each and every one of you. My day was very different. It was bitter sweet being in New York. I was so thrilled to be able to attend the Macy's Thanksgiving Day Parade with my cute friends, but it was so weird to be away from my family. My sister and I spent about half the day on the phone with each other. I didn't eat your typical Thanksgiving feast either, (I'm still sad about this) instead my dinner consisted of frozen Chinese food I cooked in the microwave. Slightly depressing right? When I moved to New York I swore to myself that I was going to go all out and experience as much as the city could offer to me. This is the main reason I choose not to go home (or to Arizona where my family was). I needed to be here for the parade and to watch Santa arrive at Macy's to officially start off the Christmas season. I learned a lot from this Thanksgiving. Sometimes being away from those you are grateful for, makes you better understand how much you love them. P.S. 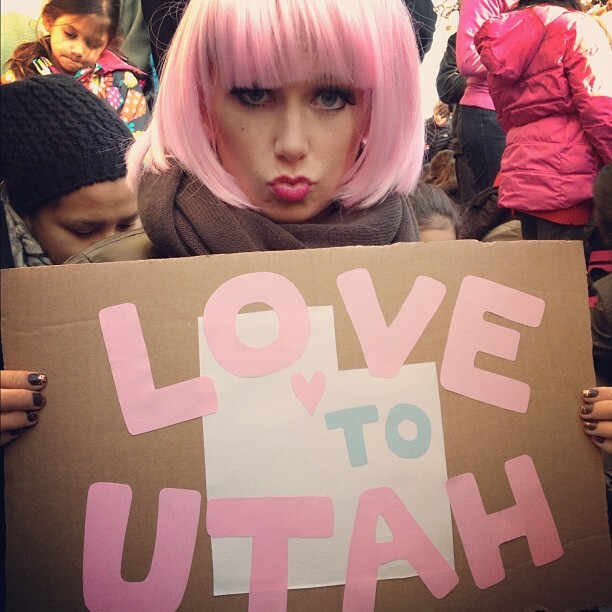 yes, I did wear a pink wig to the parade. Our goal was to get on TV and we did it!!! Spotted on CBS with Lydia. We also wore the wigs Black Friday shopping that night and made it in the newspaper. #yolo. Any crazy stories from your Thanksgiving festivities?? Did you watch the parade on TV? What are you most thankful for this year?